At the age of 6 Cesar was taken from his family in Senegal, West Africa and transported by ship to England by Captain John Parr. On arrival he was taken by cart, along with a caged parakeet, to the house of Sir John Phillips of Norbiton Place to begin his life in servitude. A slave in England at this time was an ambiguous status and they were not treated as they were in America. Paintings have shown well dressed page boys as members of wealthy households for decades before Cesar arrived. The Dysarts of Ham House close to Kingston have a Portrait of Lady Grace Carteret, Countess of Dysart, with a child, a black servant, a spaniel and a cockatoo. Accounts show that the family dressed Cesar in a turban and exotic clothes in the late Rococo style of the time but Sir John paid Cesar as a servant. 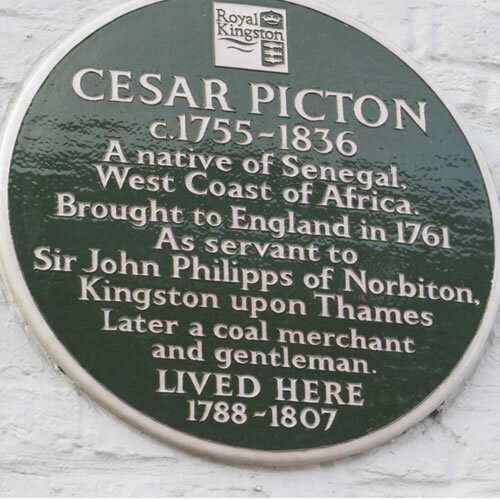 He also sent him to school and had him baptised in Kingston parish church giving him the name of ‘Cesar Picton’ (after the family’s Picton Castle, near Haverfordwest, Pembrokeshire). He was viewed as part of the family and when he was 34 in 1788 Lady Philips died bequeathing to Cesar the grand sum of £100. Sir John’s unmarried daughters also left him legacies. Cesar used his inheritance wisely to set himself up as a coal merchant in Kingston. By 1788 he was living close to the river in Kingston High Street (pictured right). In 1807 he rented out this Kingston house and moved to Tolworth before buying a house in Thames Ditton in 1816 for £400. Cesar lived in Thames Ditton until he died in 1836 aged 81. There is no record of marriage and he left his worldly goods to friends. He died a ‘respected man’ and a ‘gentleman’. He was buried in All Saint’s Church in Kingston. Cesar was a large man and it took 10 men to carry his coffin. 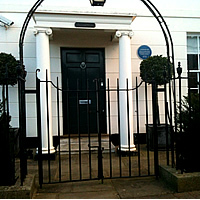 His house in Kingston is a Grade 2 listed building currently used as offices. In the 1970s Kingston Council made 3 attempts to demolish the building. 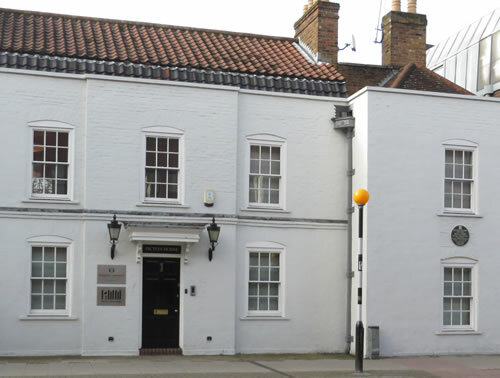 Thankfully the Kingston upon Thames Society and KUTAS joined forces to oppose the demolition and Picton’s house remains an elegant and important reminder of Kingston’s rich history.